Following two years of design, construction and landscaping, the Calgary Stampede, Calgary Stampede Foundation and ENMAX were proud to officially open ENMAX Park, a year-round gathering place for the community, on June 18, 2016. ENMAX Park is home to the 650-meter-long Cenovus Legacy Trail that weaves through the park telling the story of the area through the lenses of First Nations People, Calgary and the Calgary Stampede. The 16 acres of green space is home to The Elbow River Camp, with 26 tipis set up in a traditional circle during our 10-day festival in July. Standing on ENMAX Park, Sweetgrass Lodge combines with green space to create a beautiful and functional venue to share with the community. This space is a base for Indigenous programming, education and true community gathering. 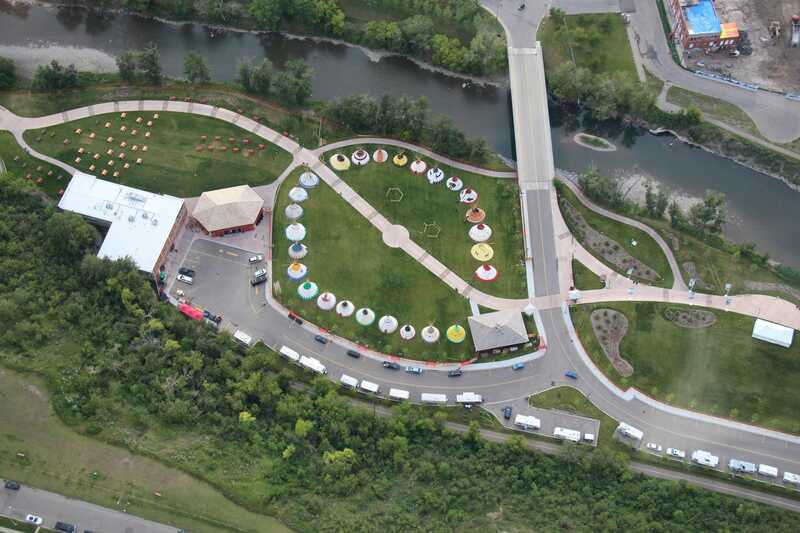 With multiple spaces to host meetings, programming, events and more in Sweetgrass Lodge, the outdoor venue of ENMAX Park is functional and ideal for hosting charity runs, private and public community events, local fairs and much more.